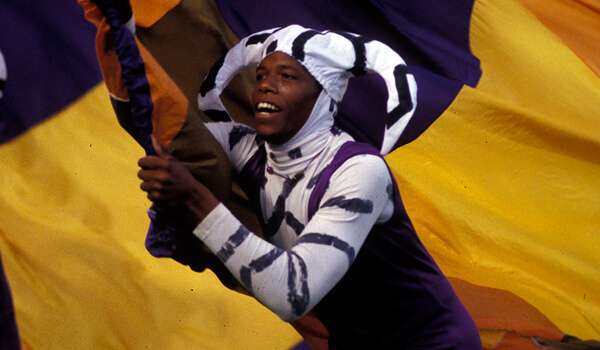 Hitting the field in 1990, Magic of Orlando first made the DCI World Championship Finals in 1994 with "Cirque de Magique, Part Deux." Picking up where the corps left off during it's 1993 production, the entire show was all original music composed by future DCI Hall of Fame member Robert W. Smith. The show started with "Cirque Fanfare & Procession" which featured circus tent props and jester's headgear on the color guard members setting the visual motif. "Odyssey" featured a member atop a tall scaffold "tic-tocking" a large wooden pendulum against two blocks of wood, creating the sound of clock while the guard wrapped large aqua blue and purple silks around themselves to create spooky, nebulous forms. A repetitive bass drum heartbeat was also heard, adding to the Edgar Allen Poe-like tension. The pendulum increasingly sped up until the "clock" ran out of steam and the member holding the pendulum was covered from behind and pulled straight back off the scaffolding. "Shongo" was akin to an African ritual celebration. The color guard put on tribal feathered headdresses and leopard skins to accentuate the primal Afro drumming. A brass fanfare poured out over the drumming, still continuing in a tempo of its own. Suddenly, a drum break turned quite celebratory and primal dancing ensued, with the music becoming jazzy and festive. A guard member was "sacrificed" to the gods and the corps carried on in celebration to the end. The next three years, the corps made the Finals, then slipped to 13th and 14th before going inactive in 2001. After bouncing back in 11th place in 2002 and 2003, the corps finished 17th, 21st and 20th before going inactive after the 2006 season. But for the 15 seasons the corps was with us, Magic of Orlando produced captivating shows that represented a unique vision of drum corps, one that is missed and appreciated more with each passing year. This week only, you can save on 1994 World Championship Audio and Video Performance Downloads on the DCI Fan Network. Buy the 1994 Magic of Orlando Video Performance Download. (Available this week only for $3.99. Regular price: $4.99.) Buy the Audio Performance Download bundle of all 12 Finalists from 1994. (Available this week only for $15.99. Regular price: $19.99.) Offer ends Monday, June 6 at 8:30 a.m. ET.